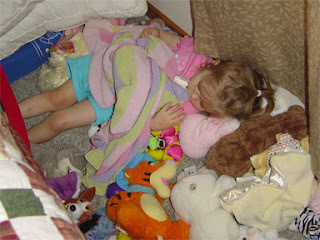 My little angel on her "Bed of Animals." She loves her fuzzy friends and apparently they make a good mattress and pillow, too. Kids can sleep anywhere! My grandma has told stories of babies she knew sleeping in dresser drawers for a lack of a crib. While the situation isn't as dire in our home, we still haven't purchased any furniture besides a mattress for our daughter now that she is out of the crib. Seems this contest posted on 5 Minutes For Mom for a South Shore Furniture set is well timed. I like the Lily Rose Set the best. Love the bookcase headboard. Oh yeah, and on this blog can't I leave out the bedtime read. Here's one of our favorite bedtime stories: Time For Bed by Mem Fox. The lullaby-ish tale with Jane Dyer's watercolor illustrations of baby animals and their mothers is sure to calm any child. "Sweet dreams, my darling, sleep well ... good night!" One of my weaknesses is children's books (if you couldn't tell). I love to buy them, and love to read them with my kids. So, I don't pass up any opportunities to buy more books, especially if I can get them free. Mommying On The Fly is hosting a Barnes and Nobles $25 Gift Certificate Giveaway on her blog. Check out her post for your chance to win. Contest ends Oct. 6, 2008. My mother has been the organist at our little rural church for 45 years. She started as the primary organist there when she was only 12 years old. When I was born, the pastor at the time gave my mom a congratulations card and in it was the note, "looking forward to seeing your little girl play at church just like you." No pressure there. Well, I took organ and piano lessons, but it just was never my forte. I liked my flute lessons a whole lot better. However, my piano teacher wasn't exactly inspiring either. Fast forward to the future. I now have my own little girl who idolizes her grandma and loves to pretend play out of the hymnal. I just learned today about a new piano teaching program called "Piano for Preschoolers." The basic course sounds like an intriguing way to introduce my young daughter to piano. Who knows, maybe she'll follow in her grandma's footsteps. A little bit about it: "Piano for Preschoolers" was developed by Angie Crellin, a mother who has studied piano for 30 years. The course includes a songbook, CD, parent guide and keyboard color strips. Your child will learn to read real music notes and to play them on real keys from the very start. Parent Reviewers blog is giving away a couple copies of the basic course: Giveaway ends Oct. 6, 2008. Click on the link below for details. I've never been to Hawaii, but would love to visit someday. If you and your kids would like to experience a bit of Hawaii, this children's book looks like the ticket. "When I am Quiet on Oahu" is part of the Tiki Tales Hawaiian book series and features animals, wonderful illustrations and even encourages readers to learn some new Hawaiian words. Check out the illustrations extra close for hidden words. Blogger Life is Like Champagne... is holding a giveaway for this book. Giveaway ends midnight 10/1/08. Click on the link below to enter the giveaway. While you are at it, check out the Etsy tikitales shop for some great gifts or visit her website for more details about the TikiTales books. Learning a foreign language is just plain easier when you're a child. Help your child start young by introducing them to Spanish with this great CD. We are Little Amigos CD includes many familiar songs including "The Itsy Bitsy Spider" and "If you're happy." The songs are sung in English and then translated in Spanish. It is perfect for the baby, toddler and preschooler in your home, at playgroup or preschool. Sing and dance along with them and pick up some new phrases together. Below is a link to the giveaway at Foreign Language Fun. Giveaway ends Friday, Oct. 3rd. I am convinced that every three-year-old girl loves princesses, at least every one I've met so far. At our house the princesses reign, from dresses to dolls to DVDs. If you've got a princess fan like mine, you won't want to miss the newest Disney release: a 50th anniversary Platinum edition of Sleeping Beauty. Set to be released on October 7th in stores, you can try to snag a copy at one of the giveaways below. Visit An Ordinary Life for your chance to win a DVD copy of High School Musical 2 Deluxe Dance Edition. This version was just released by Disney on September 23, 2008. Lots of bonus features including a HIGH SCHOOL MUSICAL 3 Sneak Peek and Interactive Dance-Along. Giveaway ends Oct. 10th. Enter at www.aordinarylife.com blog - full details there. Seven Dogs and a Baby Blog also has a contest going for this as well. The giveaway there ends on Oct. 15th. Sweepstakes: Amazon Has a High School Musical 3: Senior Year Private Movie Screening Sweepstakes going on right now. Enter to win a private movie screening for you and up to 100 friends. Entry period ends on 10/14/08. Lauren at Restored316Designs is hosting a Custom Blog Giveaway. She creates super trendy, awesome blog designs. As a newbie blogger, having the ability to design something of this caliber is beyond my skills. Can't hurt to enter the giveaway for a chance at this makeover! See below for your chance to win. Deadline to enter: October 2nd @ midnight. Thanks for visiting Brimful Curiosities! I am a busy mommy from the Midwest who also loves to blog. My family enjoys reviewing all types of products, and I welcome all PR pitches and comments. • Once you make initial contact, I will send you a reply if I am interested in reviewing your product and provide you with other pertinent information. • It helps me greatly if you include press releases, pricing and contact information when you send the product to me for review. • I do not return review products once they are shipped to me. All products I review become my property or are donated to a charity of my choice. • Reviews are free. There are no fees or charges for me to review your product. • Consider sponsoring a giveaway. Giveaways typically generate more interest than non-giveaway reviews. I prefer giveaways to be shipped by the sponsor (publisher, manufacturer, PR firm, etc). I will contact you with the winner's mailing information once the giveaway ends. • I reserve the right to deny any review request that does not fit in with the focus of my blog. • Occasionally I will publish news, specific events, or informational posts. Please feel free to contact me and we will discuss possible post options. • Currently I do not accept paid advertisements on my blog. This may change in the future. Who doesn't love a giveaway? Here are a few basic rules that must be followed in order for your entry to be valid. 1. Enter giveaways by commenting on each specific giveaway post. Please leave a comment valid to the giveaway. Vague and spam comments will be disqualified. (i.e. "Great giveaway! ", "Love to win! ", "Awesome!") The sponsors have kindly offered a giveaway. Helpful comments related to the product are appreciated. 2. You must leave some way for me to contact you. If you are a non-blogger or your email is not accessible in your blog profile, please leave a valid email address within the comment section. 3. Winners are selected via random integer generator at Random.org, unless otherwise specified. Winners are notified by email and have 72 hours to respond; if no response, the prize is forfeited and an alternate winner is chosen. 4. Giveaways open to U.S. addresses only unless otherwise specified. Giveaways prizes are nearly always shipped directly by the sponsor. Please contact me if you have not received your prize within a reasonable time frame. I will contact the sponsor to find the reason for the delay. That said, I cannot be held accountable for sponsors actions regarding giveaways. I expect them to honor all promises and send winners their prizes; failed delivery of the giveaway item lies solely on the sponsor. I am also not responsible if discrepancies occur between the stated prize and actual item shipped by the sponsor. Additionally, I cannot be held responsible for problems incurred by entering giveaways at other sites (the ones mentioned in my "Full to the Brim" postings.) I mention these giveaways only as a courtesy to my readers. 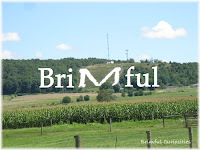 Thanks for visiting Brimful Curiosities! Good luck and hope you win some great prizes. Inkdeath, the third and last book of the Ink-trilogy is releasing on September 26, 2008 at Amazon.com. However, after reading some other posts, it may already be available at your local bookstore. The original release date was listed as Oct. 7, 2008. Earlier this September,Al Roker’s Book Club for Kids (Today Show) picked Inkheart, the first book in the series, as its latest book selection. Inkheart movie is set to be released in theatres January 2009. Disclaimer: All grammatical or punctuation errors made by this author are due to lack of practice, time, and sleep. I apologize profusely for any oversights. from the Parade Magazine Website. The site is great for discovering new books, names of books in a series, author interviews, and more. You can even find a list of books that will be released in upcoming months. They also regularly hold contests--- this month enter the BONE #8: TREASURE HUNTERS Giveaway. See site for details. Corduroy by Don Freeman is just one of those books that has always held a special place in my heart. I can remember asking my mom to read it over and over and over again, in anticipation for the part where he finally finds a home and love. If you haven't read this book yet, now is the time to pick it up. A number of events have occured this year already, with more to come including a Russ stuffed animal Corduoroy line http://www.russberrie.com/ (look under products/entertainment). Is your school part of the Firefly Scholastic Book Club? If so, in the September Flyer http://teacher.scholastic.com/clubs/clubpdfs/sep2008/firefly0908_newsflyer.pdf you can get a paperback copy of Corduroy for only a $1. What a deal!! Also, Jumpstart’s Read for the Record campaign http://www.readfortherecord.org/ is October 2, 2008 and the book this year is guess... Corduroy! 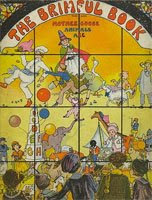 Remember a particular book from your childhood, but can't quite think of the title or author? The Loganberry Book site http://www.loganberrybooks.com is awesome...it features a custom query called "Stump the Bookseller." This is customer service taken to extreme heights, and a children's booklover paradise. Also, the site includes a list for the most requested used children's books, if you are looking for an oldie but goodie. Apparently it is a good idea to have this. So sorry, but it has to be said. In case you were wondering, this blog is a personal blog written and edited by me. I am not an expert by any means, just a plain old mom. Everything written here is my opinion solely. I only review products or feature ideas that I or my family personally believe in or like. I strive to offer you my honest, humble opinion on things I think are worthy of my endorsement. I offer no guarantees for these items or products. Any product claim, statistic, quote or other representation about a product or service should be verified with the manufacturer or provider. Other than receiving an occasional item for free to review, I am generally not compensated to provide my opinion on products, services, websites or various other topics. Should I ever generate revenue from this blog in the form of paid reviews, I promise to clearly disclose this content. In the past, I have been paid a small amount only by Celebrate Express to promote their company and I've received gift cards from Lands' End and MomCentral for a few of their blog tours. As far as advertising goes, I am an affiliate with Amazon.com and receive very small referral fees for linking to their sites from my blog. This blog does not contain any content which might present a conflict of interest. The information on this blog may be changed without notice and is not guaranteed to be complete, correct or up to date. Additionally, I don't accept responsibility for damage or harm inferred or implied, that may be caused by products I’ve featured, reviewed, advertised, or written about on my personal blog. I respect your privacy and take great care to protect any personal information related to giveaways. If you win a prize, I may submit address information to the sponsor so that they may send the prize directly. While I assume personal information will be used only to ship the prize, I don't have complete control over information submitted to the sponsors. Please know that if you include your email within the comment message box, it is available for all to see. I recommend setting up a blog profile to avoid this issue. If you don't have a blog account and feel uncomfortable leaving your email address, you may send me an email indicating that you've entered the contest but don't feel comfortable displaying your email. Any questions? Please let me know by emailing pvilletoygirl@gmail.com or brimfulcuriosities@gmail.com. That said, many thanks for your continued readership!